Kailyn Lowry, Leah Messer, and Chelsea Houska are taking a stand against their co-star. Kailyn Lowry and her co-stars, Leah Messer and Chelsea Houska, are seen taking a clear stand against Jenelle Evans in a just-released trailer for the upcoming episodes of the show. 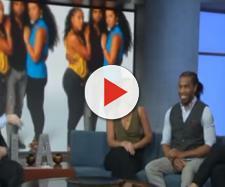 Following Monday's premiere episode of the second half of season eight, MTV released a super trailer and in it, the three women are seen meeting with their producer, Morgan J. Freeman, and threatening to leave the show if something isn't done about Evans and their newest co-star, Briana DeJesus. “So what do we do about Jenelle and Briana, so we don’t feel like we have to walk away from the show?” Lowry demands of her producer as Leah Messer and Chelsea Houska look awkwardly into the distance. Meanwhile, Morgan J. Freeman appears shocked at his reality star's question and his response isn't revealed in the clip. As fans have seen throughout the last several months, Evans has not been on good terms with her co-stars and frequently feuds with them on Twitter. She even attempted to silence them from speaking of her by sending many of them, including Lowry and Houska, letters of cease and desist. Then, more recently, Evans' husband, David Eason, took aim at Messer for allowing her daughter to wear heaving makeup to a cheerleading competition. Although the ladies of "Teen Mom 2" have been feuding for years, the tensions between them appear to have increased due to Eason's involvement in their disputes. Eason has also been accused of scaring the girls of the show by flipping out at a reunion taping months ago after being denied more drinks at an on-set bar. As some may have heard, Eason allegedly stabbed a number of balloons with a pocket knife before leaving the set. At the end of last year, months after Briana DeJesus was added to the cast of "Teen Mom 2," she and Javi Marroquin struck up a romance and began hanging out with one another as a family. Right away, Lowry expressed her frustration with the relationship and DeJesus labeled her "salty." Months later, after DeJesus was spotted with ex-boyfriend Devoin Austin, she and Marroquin parted ways. To see more of the "Teen Mom 2" cast, including Jenelle, Kailyn Lowry, Leah Messer, Briana DeJesus, Chelsea Houska, Cole DeBoer, Javi Marroquin, Jo Rivera, Corey Simms, and Jeremy Calvert, don't miss new episodes of season 8B on Monday nights at 9 PM on MTV.